Since meditation is a stepping stone for anyone embarking upon his or her spiritual quest, it is important to simplify the art of meditation for beginners. There is a very crucial difference between concentration and meditation. Most people often confuse the two concepts. Concentration can be best explained by your state of mind when you are so immersed in reading a book, that you don’t hear someone beside you calling you loudly. Thus concentration can be defined as ‘prolonged focusing’ or ‘prolonged one-pointedness’. Concentration is a much discussed concept in yoga books. 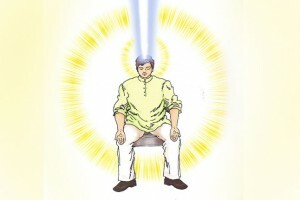 However what sets concentration apart from meditation is that enlightenment cannot be achieved by concentration alone. Simply speaking, if you are unable to hear the person’s voice right next to you, how can you hear the voice of your inner soul? How can you hear your inner OM or the ‘sound of silence’? Concentration to achieve spiritual enlightenment takes the form of meditation. Simply practicing prolonged concentration is not enough. It is equally important to practice sensitivity or awareness. This is called meditation. The concept of prolonged awareness is very prominent in the Indian culture and is known as dhyana. However, this concept is not there in the Western culture and hence there is no specific word to describe this state of being. Hence the word ‘meditation’ will be used. The concept of dhyana is understood very little by most spiritual practitioners. The concept of dhyana was brought to China from India by Bodhidharma and was named Chan in Chinese. Chan was brought to Japan by the Shaolin monks of Southern China and was named Zen in Japanese. The words Dhyana, Chan and Zen all mean ‘prolonged awareness’. In the Western culture, the word ‘meditation’ is used rather loosely. It can mean a number of things- from daydreaming to stress reduction to pondering on something. In Sanskrit, the word ‘meditation’ translates to ‘sadhana’. Sadhana can be described as ‘spiritual practice’ and spiritual cultivation’. Meditation for beginners can be difficult at the onset. When practicing Sadhana, balance has to be achieved between concentration and meditation. While concentration is important to avoid the mind drifting off, meditation is necessary to register and respond to the inner and higher stimuli. The balance required in playing a musical instrument can be compared to the balanced required between concentration and meditation in the practice of Sadhana. If the strings are too tight or loose, the desired sound will not be achieved. Hence, a fine balance needs to be achieves between prolonged one-pointedness and prolonged awareness. When you practice sadhana, there must be a proper balance between one-pointedness and awareness.In higher yogic practices, it is necessary to use prolonged awareness, prolonged concentration and oneness in order to achieve certain results. The use of these three practices is called ‘Samayama’. The word Samadhi describes the different levels of consciousness. The term was originally used to refer to yogis who deliberately left their bodies permanently to unite with their higher soul or even with their divine spark. However in popular usage, the term Samadhi can mean anyone who has died. When a person dies, it is said that the person has attained mahasamadhi. Samadhi, as used in the Yoga Sutras of Patanjali means oneness. The combined use of prolonged awareness, prolonged concentration and oneness is called Samayama. Master Choa Kok Sui explains many simple techniques of meditation for beginners all the books he has written from his vast research.